Owl Cottage01263 715779work01603 870304fax Self-cateringOwl Cottage, is situated on the outskirts and within walking distance of the beautiful Georgian town of Holt. This former railway cottage has been extended and tastefully decorated providing excellent family accommodation and within 5 miles of the North Norfolk coastal villages of Cley and Blakeney. Front view of the flint faced property with gravelled parking area. Owl Cottage offers weekly bookings starting on Saturday. Owl Cottage, is situated on the outskirts and within walking distance of the beautiful Georgian town of Holt. 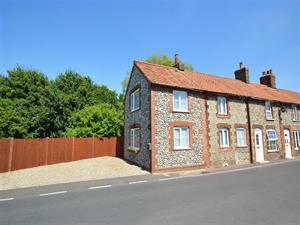 This former railway cottage has been extended and tastefully decorated providing excellent family accommodation and within 5 miles of the North Norfolk coastal villages of Cley and Blakeney. Facilities for children: Stair gate Children welcome from any age.